People become restless when restrained by regulation or command. In my search for the relationships between mood and mobility I’m led inevitably to how people’s moods change when they are corralled, constrained, and set free (if they are) — and how moods linger in the traces, memories and stories of such experiences. Restrictions on movement are among the first warnings of oppression. 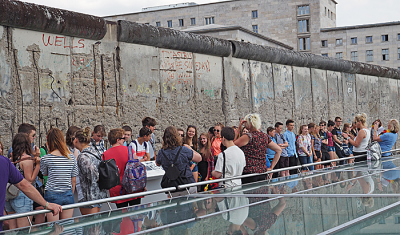 Memorials, museums, plaques, brochures, information boards, and graffiti indulge the contemporary free-roaming tourist’s curiosity about blatant oppressions of other times and places. The circumstances of 20th century Eastern Europe seem so different to those of the affluent twenty-first century European traveller, at least for the time being. Here are some images from a recent dark travel itinerary in countries formerly in the Soviet Bloc, and before that under German National Socialism. 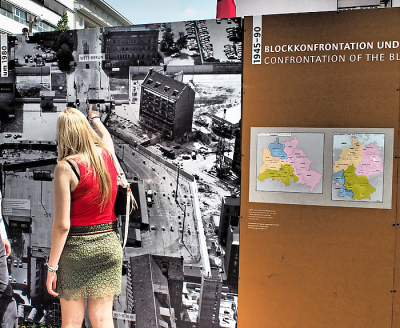 A ritual photo line-up in front of the segment of wall re-erected as part of the Topography of Terror Documentation Centre in Berlin. This was also the site of the Secret State Police and the Gestapo, demolished in 1945. 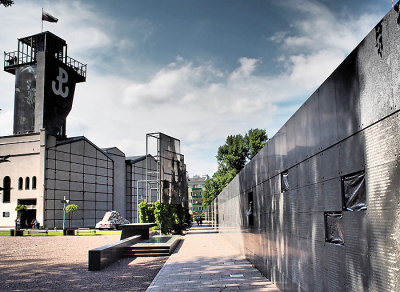 A wall of remembrance at the Warsaw Rising Museum foregrounds the city’s rebellion against Nazi repression. 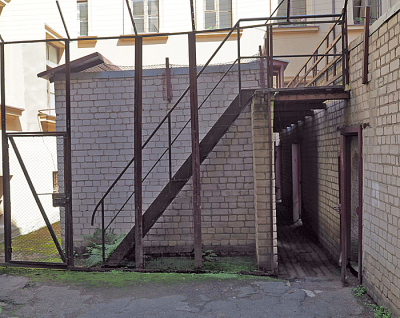 The exercise yards at the former Gestapo and KGB headquarters in Vilnius, Lithuania. Prisoners would be permitted to exercise for short periods by processing around in the open air of one of the small compounds. 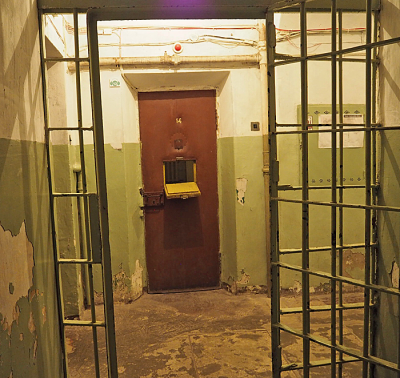 A prison cell seen from the passage leading to the execution chamber — Vilnius Museum of Genocide Victims. The main passageway between former East and West Berlin — now a major tourist and commercial draw. 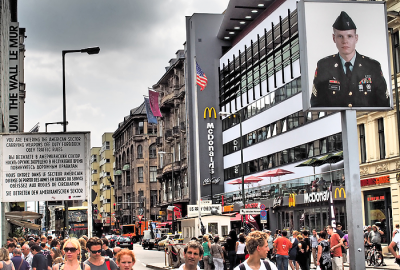 Information boards at Checkpoint Charlie indicate the scale of the dead zone created by the barrier between East and West, as well as the tragedy of separation, and failed escape attempts. In order to stick, excreted gum has to be applied rather than spat from the mouth, but suffices as a symbol of contempt. The mouth is after all the organ of in and out, of containment, of protest, escape, and the organ of anguish. In the words of the French philosopher George Batailles (1897-1962): “… the violent meaning of the mouth is conserved in a latent state: it suddenly regains the upper hand with a literally cannibalistic expression such as mouth of fire, applied to the cannons men employ to kill each other. And on important occasions human life is still bestially concentrated in the mouth: fury makes men grind their teeth, terror and atrocious suffering transform the mouth into the organ of rending screams” (59). Also see The king’s speech impediment, Urban occupy, Panoptic man, and Countercultural values. 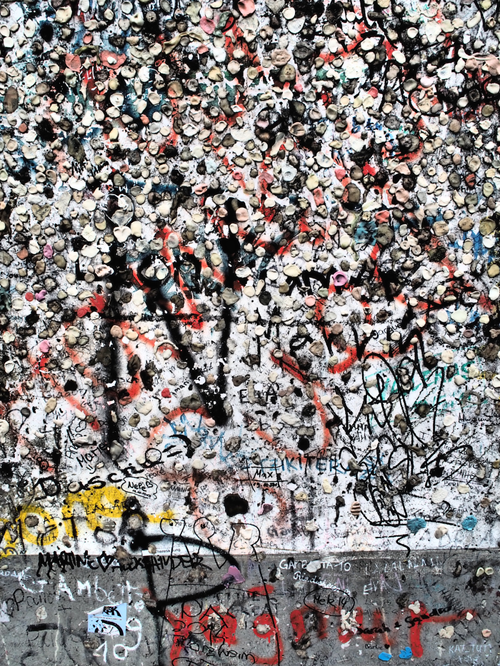 Urban theorist Wendy Pullam updates the effects of walls in divided cities. On the subject of mobility, road systems can also serve to divide, as in the case of high-speed bypass routes joining Jerusalem to settlements, which at the same time restrict Palestinian mobility: “In a city, few things are more divisive than a fast road and nothing endures longer than a road alignment. These conditions, supported by constantly developing digital systems, make mobility regimes particularly insidious in contested cities on a long-term basis” (p.31). Note added 22 July 2014. Pullan, Wendy. 2013. Spatial discontinuities: Conflict infrastructures in contested cities. In W. Pullan, and B. Baillie (eds. ), Locating Urban Conflicts: Ethnicity, Nationalism and the Everyday: 17-36. Basingstoke, Hampshire, England: Palgrave. « What do maps do?